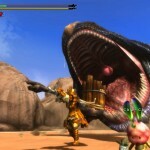 Monster Hunter has long been one of my favourite franchises. I’ve followed nearly every release of the game in North America, going so far as to purchase a Wii when Capcom decided to port the game. 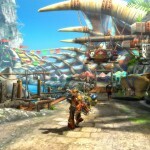 This trend continues in the third generation of the series with Monster Hunter 3 Ultimate for Wii U and 3DS. I was very excited when I heard this was coming to the 3DS and curious as to how the 3D aspect of the handheld console would affect play, if at all. Having played the demo for the 3DS, it feels like returning to an old friend. The controls are the same and nicely adapted to the 3DS’ capabilities. The only awkward aspects of the interface are the camera controls – the thumbpad controls locomotion while the D-pad controls the cameras. Now, while I am familiar with both the regular ‘Claw Hand’ positioning from the PSP and the ‘advanced’ version for the Wii, this required a finger position that immediately made me doubt the playability of the game. This was solved, however, upon inspection of the touch screen. A digital representation of the arrow pad is located to the right, conveniently large enough for thumb control, that also controls the cameras. The touch screen also has three other features in the demo: a map (which was brought down off of the main screen), an inventory icon that can be tapped and has large icons presumably for use with fingers, and a monster icon to indicate the type of monster you are fighting. I’ve always been a fan of the Monster Hunter art so it’s nice to see this bit of extra fluff. The graphics are lovely and the 3D is nice, but I found it messed with my eyes due to the fast-paced camera motions required to dodge-roll around monsters before taking chunks out of theirbutt. The combat feels exactly like the other games I’ve played and had me grinning moments into the demo. I think, perhaps, my favourite moment was discovering that tiny window of invincibility during a dodge still existed in the game. 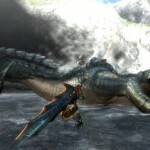 MH has a winning simplicity to its gameplay: fight stuff and harvest its bits, go foraging and collect other bits, combine all the bits into better equipment and use that to fight even bigger, badder, cooler enemies. This simplicity means the game gets addictive fast. For the Demo, there are two monster fights available: Lagombi, a giant snow-rabbit-yeti, and a Plesioth, a fishy water dragon. There’s a blend of new and familiar attacks in the monsters’ repertoire, leading me to wonder at the full roster of new monsters and the myriad painful deaths one might experience. There’s also the addition of the companions that look very much like the chaotic Shaka-lakas of previous games that assist you in fights. Considering there are two in the demo, I might consider that a hint as to the level of difficulty of the combat in later parts of the game. The full range of weapons are available to try, including traditional and more recent additions like the hunting horn and the switch axe. Unfortunately, it won’t let you check out the specs of the items so one can only presume they’re showing off would-be top tier items given the special HP-regen and the blue sharpness of the sword-and-shield not normally available in lower tier items. Now, for all its familiarity, the demo is great for someone who’s an old hat at the game, but for newbies I fear that the lack of any in-game tutorials will make it difficult to enjoy. With literally zero control explanation, one is left to flail at the keys to find out how to scroll through items, use said items, use special attacks, roll, run, block etc. This doesn’t strike me as particularly smart but perhaps Capcom is relying on the tried and tested established fanbase of Monster Hunter to carry it through? Hopefully this is remedied when the game is officially released on March 19th. Overall this game has me excited and eager to purchase. 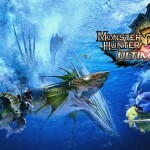 With massive angry monsters, crazy pumpkin people, 3D environments, and combat that’s never the same twice to look forward to, the third generation of Monster Hunter looks poised to be a great installment.